— Connections Academy: This company has online public schools in a variety of states, and has been hiring home-based K-12 Teachers for years. Just look for “Home-based” under the “City” heading on their job pages. For more, click here. — BrainMass: BrainMass connects North American Teachers with students who need immediate answers to their questions, as well as via eBooks. “You’ll receive direct compensation for the help you provide, based on how complex the problem is. Further, if your response is approved by our editors it will be included in our Solution Library for subsequent resale that can earn you additional ongoing income per download.” You can also get paid per download for eBooks. To qualify, you must be studying for or have earned a master’s or doctorate from an accredited university. For details, click here. — VIPKID: VIPKID hires people to teach children in China online. Pays $14-$22/hr., set your own hours. You’ll need a bachelor’s degree in any field, and a year of teaching, mentoring, tutoring or alternative education. Some VIPKID teachers, like Dan Didio, reportedly make $75,000 a year, but he teaches over 65 hours a week. I was an English conversation teacher in Italy, and 65 hours a week would have killed me. In any case, the video interview is key, so be sure to prep. Click here for more. — K12, Inc.: “K12 offers an outstanding curriculum that enables mastery of core concepts and skills for all kinds of minds.” The company often lists home-based teaching jobs in a range of states. For jobs open now, click here, then click on “Search Current Openings.” Look for “Statewide” under the “City” heading. — Smarthinking/Pearson: “Join our team of online tutors: In over 150 subject areas, we’re looking for: faculty, graduate students, professionals, retirees, all passionate about helping students improve their lives through learning. Our online writing tutors help students communicate more effectively in every subject, and our career writing specialists help them craft resumes and employment materials to get better jobs…” For more, click here. — University of Maryland/University College: UMUC hires adjunct teachers for a wide variety of online courses. Hires nationwide. Their subject mix changes regularly, so be sure to bookmark the jobs page and check back often. Some require a master’s degree, others a doctorate. Click here for more. — Varsity Tutors: This company offers tutoring in hundreds of academic subjects and more than 50 test prep areas. Tutors are independent contractors. Per online reviews, they earn an average of about $20/hr. “Private tutoring sessions take place online, in the student’s home, or at another location of the student’s choosing. Instant online tutoring is also available through the Varsity Tutors platform in subjects like algebra, biology, calculus, the SAT, and more.” Click here for more. — Revolution Prep: “Within their first year, our tutors earn between $25 to $30 per hour (including bonuses). Our tutors are paid for every hour worked, are eligible for full benefits, and work from the comfort of their own homes. We invest in our tutors’ ongoing development; each week they have the opportunity to collaborate with a highly skilled and educated learning community to share best practices.” Click here for more. — Education First (EF): Hiring people nationwide to teach English online to children in China. Pays $12-$19/hr. Materials provided, set your own schedule. Requirements include a bachelor’s degree in any subject, willingness to obtain 40 hour TEFL Certificate or equivalent if you don’t have one. “Life experiences” also an advantage. Click here for details. — Cambly: No experience necessary. If you speak fluent English and are looking for a side gig, Cambly continues to recruit people to chat with English learners. You’ll need a laptop or desktop with high-speed internet. Hiring nationwide. Pays $0.17 per talk minute (hourly rate of $10.20). Click here for more. — Brigham Young University-Idaho: BYU-Idaho hires online faculty for a variety of courses. Applicants are accepted from Arizona, Arkansas, California, Colorado, Florida, Georgia, Idaho, Illinois, Indiana, Massachusetts, Maryland, Michigan, Missouri, Montana, Nevada, New Mexico, New York, North Carolina, Oregon, Texas, Utah, Virginia, Washington and Wyoming. For online jobs open now, click here. — Chegg: Tutors register at Chegg, and the company supplies the students and handles the rates and billing. Work from anywhere with an Internet connection, set your own hours. “Top tutors can earn $1,000 plus/month. Starts at $20/hr.” Students come from all levels — middle and high school, college, and professional. “Thousands of subjects.” For more, click here. — Tutor.com: Tutor.com hires college students and graduates to tutor as independent contractors. Per reviews, average hourly pay ranges from $10.00 to $20 or more, depending on the subject. “Incentives for high-quality tutoring.” Tutors must be available at least five hours per week. A wide variety of subjects is covered, many at the high school level, plus SAT and other test prep. Tutoring is done via the company’s online classroom. For more, click here. For more extra-cash options and jobs, click here. To be the first to hear about work from home jobs and side gigs, like our Facebook page and check your feed for our posts. 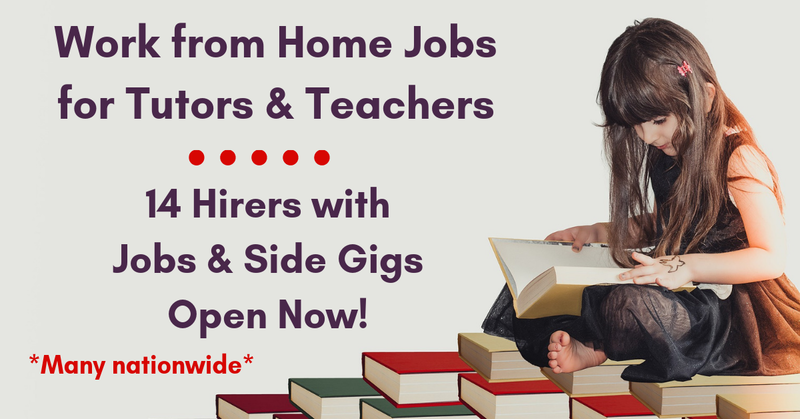 Good luck in your work from home teaching plans!